As for the two shows reviewed here today, the common economic theme is expressed in the title of one of them: A Playhouse Recessionary Christmas, currently at the Arcata Playhouse. That's pretty clear, but it also suggests to me that the economy might have been a subtle factor in the shows of Christmas past. 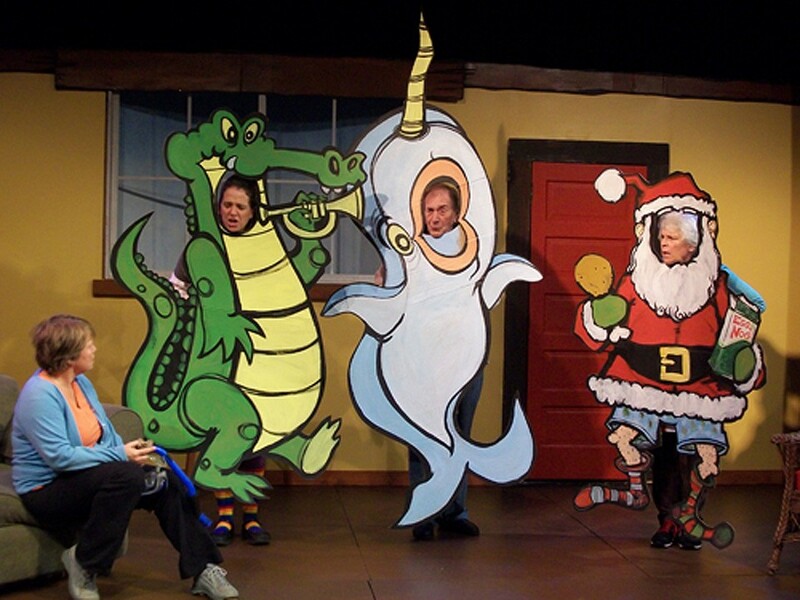 Back in 2007, when the economy was seemingly riding high, fueled mostly by the fantasy of making money by moving money around with no visible means of support, we had our fantasy-laden Lewis Carroll Christmas at Dell'Arte and Ferndale Rep. But in 2009, after it was all exposed as illusion and the Great Recession was underway, we had our Dickensian Christmas at NCRT as well as Dell'Arte and Ferndale, with children in rags ignored by the 19th century 1 percent. As do the first two shows mentioned, A Playhouse Recessionary Christmas portrays a family preparing for the holidays. This time the parents, Esther and Frank Happy (played with sweet hilarity by Lynne and Bob Wells) are taking in adult daughter Violet (Jackie Dandeneau) because her house is in foreclosure. Her wild younger sister Rose (Amy Tetzlaff) is already there, and Violet brings her two children, Lily (Amelia David) and Daisy (Cora Dandeneau). But the script by Tyler Olsen doesn't dwell on the foreclosure situation directly, though the payoff at the end concerns recessionary gifts. The story goes off in other twisted sitcom directions, including Rose's green wax obsession and Frank's campaign to unmask Santa as an alien in league with corporations. It's all also a pretext for music, including a unique "Twelve Days of Christmas" by Lynne and Bob, songs by Jackie and by the band of Tim Randles, Tim Gray and Marla Joy ("Grandma Got Run Over By a Reindeer" is one) and by different guest artists at each performance. The kids (Amelia and Cora) are delightful troupers already. The show is directed by Lydia Foreman (who also designed the costumes), with set by Lush Newton and lighting by David Ferney. There are surprises and silliness for the whole family, for one more weekend at the Arcata Playhouse, with guests Ross Mackinney and Sienna Nelson on Thursday, The Marching Lumberjacks, Gwen and Brian Post on Friday and Kathe Lyth and the Redwood Children's Chorus and Art Jones on Saturday. Meanwhile, the Dell'Arte holiday show is on the road. This year the textual victim is The Nutcracker, as three poor mice turn to crime and learn who their real oppressor is (the dirty rat) in The Nutcaper. With the comic ballets to that familiar Tchaikovsky music, this has the gentle charm of shows that kids put on for themselves. Performed with Dell'Arte School skill, it's probably the most child-oriented of the Dell'Arte holiday shows I've seen, though there are of course a few class warfare jokes for grownups. Meredith Anne Baldwin, Rachel Brown and Meghan Frank are the lovable mouse trio. Myque Franz is the Nutcracker (who turns out to be another exploited worker) and Pratik Motwani is the suitably sinister Rat King who might remind older kids (really older) of the Blue Meanies. Joan Schirle directs, with choreography by Laura Munoz. Daniel Spencer designed the sets, Lydia Foreman the costumes, Michael Foster the lighting, Tim Gray the sound. The Nutcaper is at the Eureka Theater on Dec. 10, and the Van Duzer at HSU on Dec. 13 before returning for paid shows at the Carlo Dec. 15-18. Coming Up: Northcoast Preparatory and Performing Arts Academy presents a musical adaptation of The Odyssey, featuring the First Family of Ithaca (Odysseus, Penelope and Telemachus), with a special guest appearance by the goddess Athena, Wednesday, Dec. 7, through Saturday, Dec. 10, at 7:30 p.m. (plus a Saturday matinee at 1:30) in the Studio Theatre at HSU. Adapted and directed by Gretha Omey Stenger. Reservations at brownpapertickets.com or 445-2355. The Ladies of the Flies, a new play based on William Golding's classic novel Lord of the Flies, is a work-in-progress created by an ensemble including Dell'Arte Company member Zuzka Sabata, Synapsis Arts Collective co-founder Leslie Howabauten and Dell'Arte grads Cara McClendon and Elana Levitan. Described as "a parallel to the original," the ladies illuminate themes of violence, power and adolescence through a feminine lens. Performances are set for Friday, Dec. 9, at 8 p.m. at the Synapsis Warehouse (47 Third St. in Eureka) and on Sunday, Dec 11, also at 8 p.m. at the Arcata Playhouse. The Dell'Arte School's second years present their Character Projects (one act plays) Dec. 8-11 in the Carlo. On Thursday Dec. 15 at 7:30 p.m., Jeff DeMark and the LaPatina band perform That Train Has Sailed, his new show that's evolving from recent live performances, at a new performance venue: the Sewell Gallery of Fine Art at 423 F St. in Eureka. The LaPatina's are Paul DeMark, Jim Hatchimonji, Andrew Goff, Neil McLaughlin and Deric Mendes. For one night only, North Coast Repertory Theatre presents a mostly musical and entirely family-oriented evening, Christmas at NCRT, with the Redwood Dixie Gators Jazz Band and the Bare-Stage Singers. It's Saturday Dec. 17, at 7 p.m. 442-6278, www.ncrt.net. Continuing: A Christmas Story at Ferndale Rep through Dec. 18 (Thurs-Sats at 8, Sundays at 2), and the final weekend for Some Assembly Required at HSU (Thurs-Sat at 7:30, Sunday at 2), which I've seen but due to institutional conflicts, I cannot offer an opinion. However I can report that on opening night there was a lot of laughter in Gist Hall Theatre.